Michigan Snyder recall petition approved. Michigan Gov. 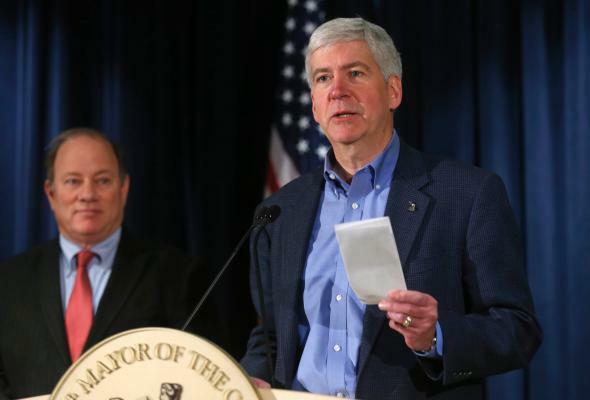 Rick Snyder at a press conference in Detroit on Dec. 10, 2014. Michigan’s Board of State Canvassers has approved the wording of a petition to recall Gov. Rick Snyder, MLive and the Detroit News report. Caveat: While the governor has been in national headlines because of the Flint lead-poisoning crisis and specifically because of decisions made by emergency managers he appointed to run that city, the petition that was approved on Monday actually cites an executive action Snyder took regarding the emergency state takeover of certain schools. The petition’s backer now has 60 days to collect 790,000 signatures; if he’s successful, a measure to recall Snyder would appear on Michigan’s ballot in November. The Board of Canvassers has rejected a number of Flint-related petitions on the grounds that they were not specific enough about why Snyder should be recalled from office. The Detroit Free Press reported on Jan. 28 that while 58 percent of Michigan residents believe Snyder is doing a poor job as governor, only 29 percent believe he should resign; that poll, however, was released before the publication of March 2015 emails alerting the governor’s office that some public health officials believed Flint River water was responsible for an outbreak of Legionnaires’ disease in the city. Snyder said he wasn’t told about the link until this January; perhaps even more problematically, some of the Snyder administration officials who learned about the Legionnaires’ outbreak last March were involved in downplaying and outright denying the existence of problems with Flint River water in summer 2015. Snyder has been Michigan governor since 2011; he won re-election in 2014 and would be prohibited from running again in 2018 by term limits.